Gearman is a Job Server which has many language interfaces. If you are familiar with Python Celery then you will understand at a glance. Unlike Celery, Gearman is a task runner. The only difference is in Gearman, you have to program your worker too. I love Gearman because not only tasks but also the worker can be written with any suitable language. Also the core of Gearman is built with C/C++, that’s why it is very very fast. Say, you are working with PHP and you need a background task runner, go for Gearman. Don’t worry, many big companies are using it like Craig’s List, Tumblr, Yelp, Etsy etc. Now, let’s create a Background Task Runner for our PHP Application. To do that we need to install gearman server on our PC / Server first. If we are using Ubuntu then it is very easy like sudo apt install gearman-job-server and there are tons of article how to install gearman. Feel free to install it first. Then we have to install the PHP PECL extension for gearman. In Ubuntu we can simply run sudo pecl install gearman. Again, there are tons of articles on how to install gearman libraries on your PHP. When you have done with the installations, let’s jump directly into coding. Don’t forget to run the gearman job server. Now we have to keep the worker running. Simply just keep the worker running in our terminal like php gearman-worker.php and then run the client from another terminal like php gearman-client.php. Note: You have to keep the worker running. 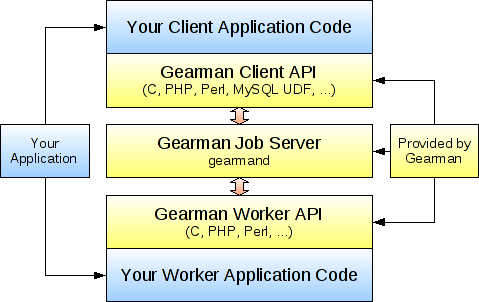 This is a simple way of making own worker using Gearman. There are plenty of ways we can use gearman and that’s the fun of using it. Hope you guys like it.